Official artwork of Navi from Ocarina of Time 3D. Navi is one of Link's many partners. Navi in Ocarina of Time 3D. 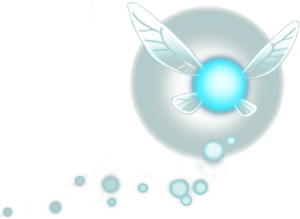 Navi first appeared in Legend of Zelda: Ocarina of Time as Link's companion fairy. Navi serves as a guide for Link on his journey by request of the Great Deku Tree Great Deku Tree. She’ll give information on Link’s enemies and even warn him of attacks. Navi will also inform Link on his current task. After Link defeats Ganondorf, Navi leaves for unknown reasons. In Legend of Zelda: Majora's Mask, which takes place after the events of Ocarina of Time and Ganondorf's defeat, Link (as a child) had set off to find Navi before running into the Skull Kid and finding himself in Termina with Tatl. Navi as part of Link's Side Taunt. In Brawl, Navi appears as part of Link's side taunt. She’s also in a cutscene during Adventure Mode: The Subspace Emissary, where she’s in a forest with Link to pull the Master Sword out of its pedestal. Navi once again appears as part of Link's side taunt in both version of Smash 4,. Navi also appears alongside Link as a trophy in the 3DS version. Navi now only appears as part of Young Link's side taunt. Interestingly, Navi, along with fellow fairies Tatl and Ciela, are the only ones of Link's partners not to be Spirits in Ultimate. Although Navi appears alongside Link in a trophy in the 3DS version of Smash 4, though not mentioned, Ciela is the only fairy that has gotten a trophy. This page was last edited on April 2, 2019, at 14:27.